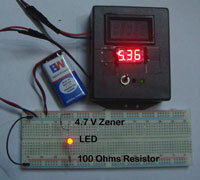 A simple LED Volt Meter using Zener diodes as switches. If it is connected to a 12 Volt battery it shows the following indications. This Panic Alarm helps old aged people and those who are in bed rest to catch the attention of others in case of an emergency . It generates a loud Ambulance Siren when its Button is pressed. It can also be used as a Personal alarm during travelling. If there is any threat or emergency situation, it can help you to invite the attention of others. It is too compact ,handy , battery operated and can be kept in the bag or pocket. Its cost is just Rs.80 including battery. 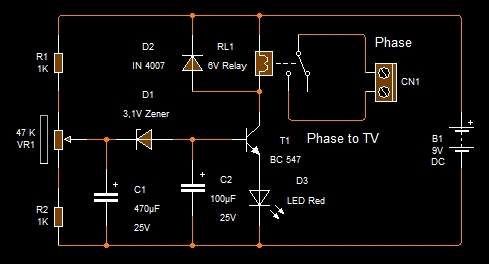 This Tiny circuit can protect your LCD TV from Voltage surge at power on. It takes 2 minutes delay before connecting power to the TV. Within that time, mains power will become stable. Heavy inrush current at power on or when power resumes after a power failure can damage the TV permanently. If few minutes delay is provided, the AC will become stable. This is the delay technique used in Stabilizers. 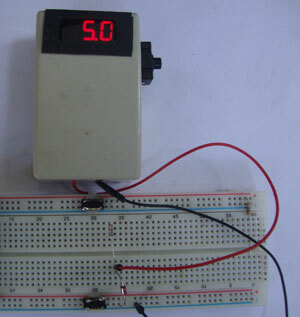 This is one simplest form of Over voltage Protector for the Bread board power supply. Usually we use 12 volt DC power supply to power the bread board. If the CMOS devices are used in circuit assembly, over voltage can damge them permanatly. 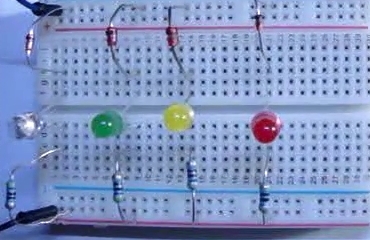 This circuit limits the voltage to the bread board to 12 volts. If the voltage increases above 12 volts due to a high voltage surge in the AC lines ,the circuit cut off the power to the bread board. It can also be used in any device like Chargers that works on 12 volt DC . This is one simple but highly useful circuit for you. Most of us use different types of Rechargeable batteries in Portable devices, Inverter, Emergency lamp etc. If the battery is deeply discharged, sometimes it will not get fully charged later. This is the most common reason for the failure of Emergency lamp. So we need an indicator to show the safe level of battery voltage. It is too simple to make it and needs only three components. Just hook up it in the battery and it will remind you when it needs charge. 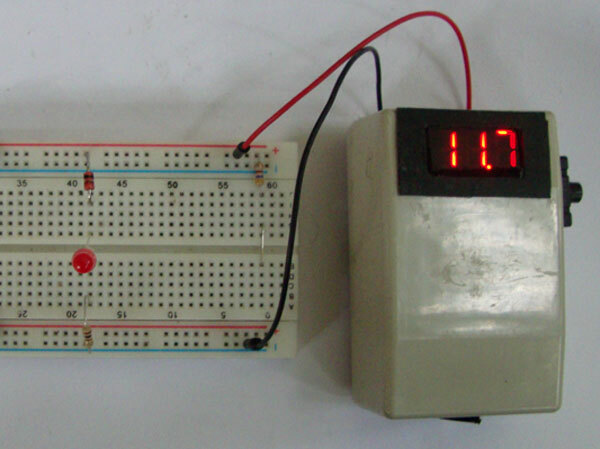 This is the simplest type of Voltage Monitor you can build in 5 minutes. No need for a PCB and just solder lead to lead and hook up in the Emergency lamp. 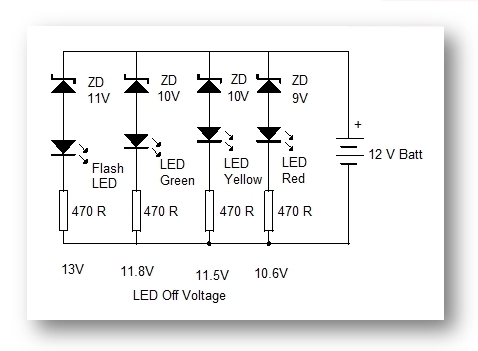 As long as the battery voltage is above 5 volts, LED lights to indicate a healthy battery. 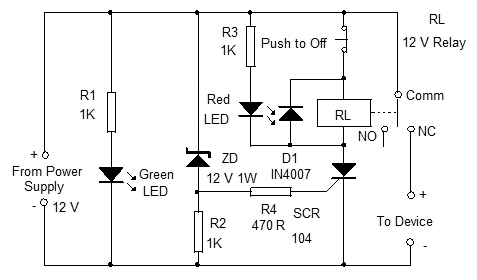 When the battery voltage drops below 4.7 volts, LED turns off to indicate the time for charging. It is a must for emergency lamp since deep discharge permanently destroys the battery. Let us see what is happening in the emergency lamp battery.